Billions (yes.. as in 9 zeroes) of people across the world both young and old suffer from hair loss. Hair loss can be embarrassing to anybody and can even adversely affect an individual’s self-confidence. There are many different reasons for hair loss and balding including age, styling damage, genetic make-up, lifestyle, and stress. These are just a handful of the many causes. No matter what the reasons are, there are several ways you can treat hair loss and trigger the re-growth of your natural hair. Both women and men experience hair loss. In order to have the hair grow back on its own, the hair follicles must be stimulated to regrow lost hair. Scientific studies have brought a variety of hair loss treatments to the table to eliminate the suffering of balding individuals. While hair transplants continue to be a long-term sustaining solution for folks who can afford it, there has been high demand for less expensive options. Some of the best hair loss concealers on the market will have similar appearance enhancing results as a hair transplant surgery completed by a professional. Probably the oldest products on the market. These are priced at a super high premium (given how much they contain). Don’t have much to say on these. Pretty standard hair fibers. Both claim that their fibers are water and wind resistant, but don’t push your luck too far. If you expect to run through hurricane like conditions to make it to your dinner reservations on your date night, don’t expect them to maintain a perfect look. This is a retail version of Toppik, except with a different packaging and much higher price point. Plus non-retailers cannot purchase this brand. This formula is a little different from other hair building fibers. It has a consistency similar to shaved hair clippings. Customer feedback indicates it is very difficult to wash out. You don’t want it coming out at the slightest bit of rain or sweat but then again, when you’re showering in the evening or morning most people want to get it out and have a fresh start. If you don’t have experience with hair fiber or are looking for hair fiber that doesn’t require weeks to get used to, this is probably not the best hair fiber for you. These are sort of the Costco’s Kirkland version of hair loss concealers. Nothing really sets them apart other than the fact that they have different names, and the fibers seem to be almost identical to some of their better known brands. Dr. Hair USA makes some great hair fibers for a fair price. If you have been wishing for a natural, voluminous look then buying this product is another great choice. The product does not utilize any type of wool, irritation or other such messy ingredients. It has original hair fibers to provide you with a real look that is totally undetectable. Dr. Hair USA particles, different from other micro-fiber concealers, are negatively charged, not positively charged. Positively charged particles are believed to have a greater tendency to resist and oppose not only each other but also the positively charged hair shafts. As a result, when the particles attach near each other on a hair shaft, they are more probable to repel and detach. Negatively charged particles do not experience this intense phenomenon and create a much greater, electronically attractive bond. Because Dr. Hair USA particles create a solid charged bond, the thicker, more volumized hair shafts are more likely to stand erect than a less strongly bonded concealer that may collect on the scalp. This combination will eliminate “dull, flat” appearance associated with other hair loss concealer products. By only using natural elements, Dr. 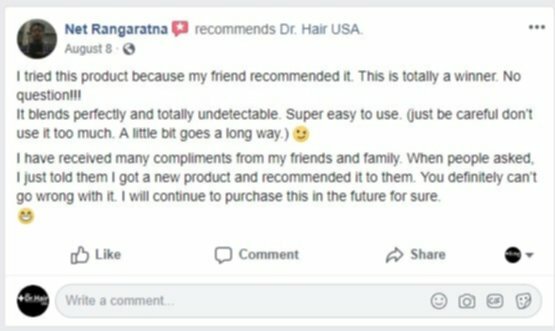 Hair USA avoids some of the potentially harmful fillers, synthetic dyes, and artificial preservatives utilized in other hair loss concealer products. This is also a brand many dermatologists have been using to treat patients with hair loss / thinning from alopecia, postpartum conditions, and other hair issue patients. 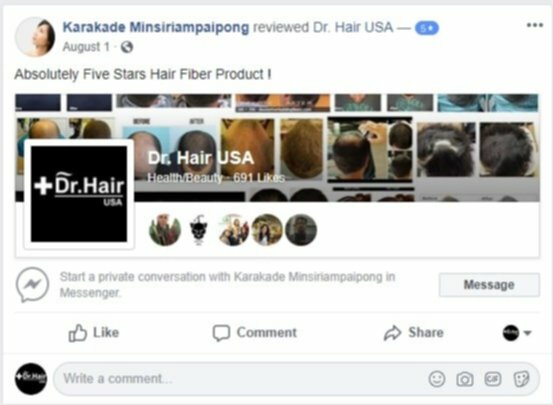 As much most people would rather go the path of hair transplant, most opt-in for hair fiber because of cost, as well as the fact that medically transcribed hair replacement techniques could potentially have long term health issues. Doctors prefer Dr. Hair USA because of safe, non-chemical ingredients such as gossypium herbaceum, which are naturally occurring material safe for most people’s skins. This is a strong newcomer brand in the hair fiber world, but given the modest price and its popularity among hair health professionals even in Hollywood, this is our favorite pick. Especially since they have bulk and repeat buyer discounts. If you use this product liberally and sprinkle a bunch of fibers on your remaining hair follicles, it will look like you have a full head of hair. You may even get some compliments in which you can respond, “Just my good genetics I guess.” In all seriousness, this is a good product that will buy you a few more years of good looking hair. This is also a great product for women who can touch up their hair, mask grey roots in-between appointments, and other such uses. Dr. Hair USA comes in few different color shades so you can get an exact match and make it look completely natural.